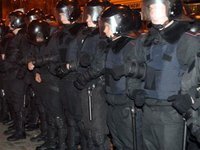 A large convoy of Berkut riot police officers has entered the courtyard of the National Radio Company of Ukraine, which is located at 26 Khreschatyk Street. An Interfax-Ukraine reporter said that a large column of servicemen of interior troops is on Mykhailivska Square. UDAR Party leader Vitali Klitschko is also on the square, and he is holding talks with police officers.